DENVER—Starting early next week and ending early Thursday, Nov. 8, crews will temporarily close the York Street and Union Pacific Railroad crossing just north of 47th Avenue to vehicles and pedestrians as crews complete work on the tracks. Take 48th Avenue to Baldwin Court to 46th Avenue to Brighton Boulevard to I-70 and back to York Street. Take 46th Avenue to Steele Street to westbound I-70 to Brighton Boulevard to 46th Avenue to Baldwin Court to 48th Avenue. RTD bus Route 48 will run using the detour. Northeast Transportation Connections (NETC) will provide free shuttle service Monday through Friday. Access a free, additional daytime pedestrian shuttle throughout the closure. Call 1-833-C7O-INFO for run times. Denver Public Schools (DPS) runs its Success Express service, with several trips to Swansea Elementary School in the morning and afternoon. A shuttle will leave the Valdez-Perry Branch Library at 9 a.m., 1 p.m. and 6 p.m., and will return to the library after passengers vote. The City of Denver has added a dropbox at Swansea Rec Center (2650 E. 49th Ave.) for voters to drop off their ballots from 10 a.m. to 6 p.m. Monday, Nov. 5 and from 7 a.m. to 7 p.m. Tuesday, Nov. 6. Visit DenverVotes.org to find the nearest full-service vote center. Centers are open now across the city, with more locations opening as Nov. 6 approaches. 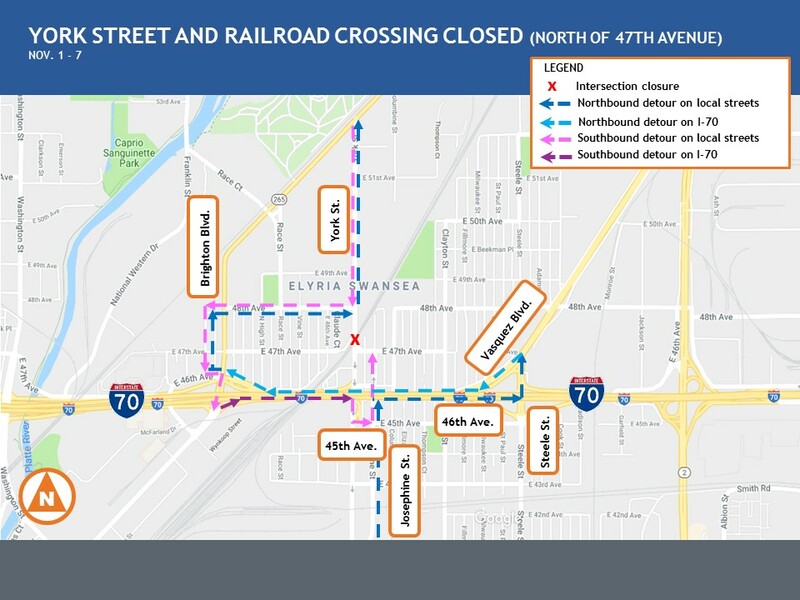 The Central 70 Project will reconstruct a 10-mile stretch of I-70, add one new Express Lane in each direction, remove the aging 54-year-old viaduct, and lower the interstate between Brighton and Colorado boulevards. Learn more.